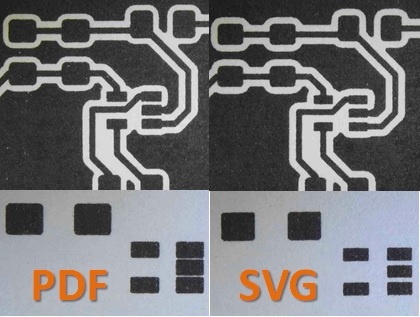 Surface mount PCB artwork requires you to print designs smaller than a grain of rice. Is this even possible with my home laser printer? One of my New Year’s Resolutions was to try my hand at using tiny surface mount components. I have never made my own printed circuit boards with the fine resolution required for SMD. If you check the surface mount PCB artwork in the above graphic, you will see a bunch of large and small copper pads connected by traces. When I etch the board, the copper underneath the black mask will remain. The copper under the white areas will be etched away. The etching mask is shown in the top half of the picture. In the lower section, you can see actual pads from component footprints. The large rectangles are for 1206 resistors. “1206” means that the component size is 0.12″ long and 0.06″ wide. If you speak metric, that means 3.2 mm by 1.6 mm. Very small indeed. But get this. The soldering land pattern of these resistors is even smaller. Each rectangular pad at each end of a 1206 resistor is 1.6 by 0.9 mm. This is the pad where you mount and solder the component. Even smaller is the footprint for the op amp I am using as a transimpedance amplifier. If you check out its package, you will see it is called an SOT-23-5. That means its SOT-23 package has five pins. The width of each pad on an SOT-23 op amp is less than 0.5 mm, or about half the width as for the resistor. Let’s make this discussion real. Go to your kitchen pantry and find the rice. Measure a couple of grains of rice with your digital calipers. You will find these grains of rice have a diameter around 2.0 mm. So, this means that the SMD solder pads we are taking about are half the width (or less) of a grain of rice. No wonder you need a microscope. As you know, I use the toner transfer method to make printed circuit boards. This involves printing out a circuit board design on a laser printer, and then ironing the pattern onto a copper board. The heat from the iron transfers the toner to the copper board. You recall that the toner covers the copper so it is not etched away later. My first question was whether or not my printer could produce small enough graphics to make the PCB. The answer is yes. The picture on the left shows my result when printed the KiCAD PCB board to a PDF file. Even better results come from creating an SVG (scalable vector graphics) file and then printing it using Inkscape. You can really see the different in the SOT-23-5 solder mask at the lower right edge of the bottom pictures.